In the country-noir tradition of Winter's Bone meets 'Breaking Bad,' a savage and beautiful story of a young man seeking redemption. The area surrounding Cashiers, North Carolina, is home to people of all kinds, but the world that Jacob McNeely lives in is crueler than most. His father runs a methodically organized meth ring, with local authorities on the dime to turn a blind eye to his dealings. Having dropped out of high school and cut himself off from his peers, Jacob has been working for this father for years, all on the promise that his payday will come eventually. The only joy he finds comes from reuniting with Maggie, his first love, and a girl clearly bound for bigger and better things than their hardscrabble town. Jacob has always been resigned to play the cards that were dealt him, but when a fatal mistake changes everything, he’s faced with a choice: stay and appease his father, or leave the mountains with the girl he loves. In a place where blood is thicker than water and hope takes a back seat to fate, Jacob wonders if he can muster the strength to rise above the only life he’s ever known. 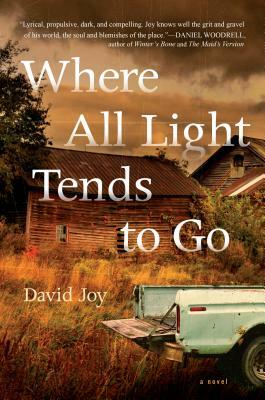 David Joy’s stories and creative nonfiction have appeared in Drafthorse Literary Journal, Smoky Mountain Living, Wilderness House Literary Review, Pisgah Review, and Flycatcher, and he is the author of the memoir Growing Gills: A Fly Fisherman’s Journey. He lives in Webster, North Carolina. Where All Light Tends to Go is his first novel.